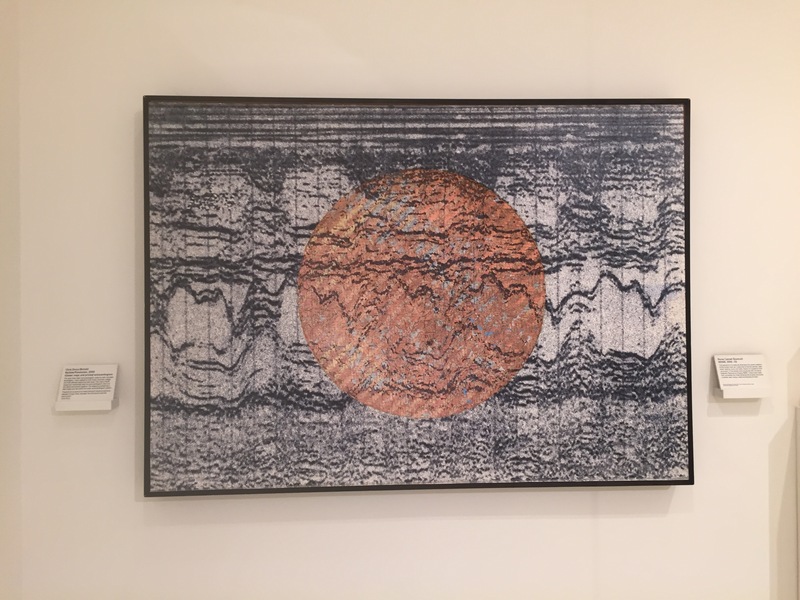 Chris Drury’s ‘Rockies / Karakorum’ is a three-dimensional picture composed of woven maps of the Rocky and Karakorum mountain ranges, which have been overprinted with echocardiogram patterns. It is predominantly black and white monochrome with the exception of the negative impression of a red dish pushed into the centre of the picture. The picture is shown in The Body gallery of the Medicine Now exhibition at the Wellcome Collection. The gallery includes a selection of works that “examine new techniques and ways of looking at our internal biological structures and functions”. Looking closely at the picture reveals the topographical lines and layers of the interwoven maps, which appear as cut away sections of rocky canyon strata. Standing back from the picture gives way to the outline of a mountain range; a distant, high-altitude horizon of jagged, sedimentary peaks. Being in remote, inhospitable environments reminds us how incredible our bodies are: able to adapt to environmental extremes and even altering physiologically to maximise our biological performance. We become truly self-dependent – a realism less often experienced in civilisation where easy access to technologies like the echocardiogram allow us to assess our health, and to diagnose disease. I feel drawn to this picture having visited the Karakoram region and other similar inhospitable landscapes. Drury’s description of the work talks about the physical challenge of walking in these mountain ranges, and which for me, evokes memories of exhaustion; claustrophobia; shortness of breath; headache; deep blue skies; peace; freedom; and infinite horizons. It is in this way that Rockies / Karakorum exudes positivity about life, the incredible biological system that is the human body, and the limits to which we can push ourselves. It is of course balanced with the reality that ultimately we are bound by our capabilities, and by the forces of nature: a symbiotic relationship, which we should respect.